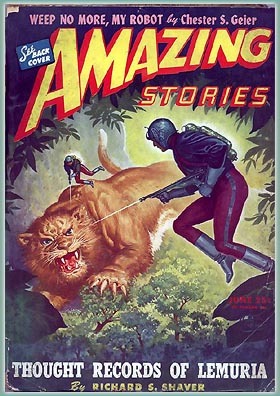 Here’s a whole collection of great old pulp magazine covers posted at a collectors’ forum. Everything from detective fiction to science fiction, westerns, war stories and whatnot. Some great, great stuff. I found it through a post by Mark Seifert of Avatar Press at the Whitechapel Forums, in this equally nifty thread there. Canny readers may note that I infiltrated it with one of my own neo-pulp posters.